To get around town in the cold and wet weather of Minneapolis, many people choose a yellow taxi. Patagonia prefers to see the sights from inside the warmth of their Topley Jacket. Insulated for the coldest conditions, this jacket has an urban-friendly design and an H2No® Performance Standard 2-layer 100% recycled polyester ripstop shell with a waterproof/breathable barrier and a DWR (durable water repellent) finish for storm protection in any weather. Insulated with 600-fill-power Recycled Down reclaimed from duck and goose down products, it wraps you in compressible warmth and keeps your psych high as the temperature drops low. The 2-way-adjustable, removable hood is insulated for warmth and comes with a laminated visor to protect your face while preserving visibility. 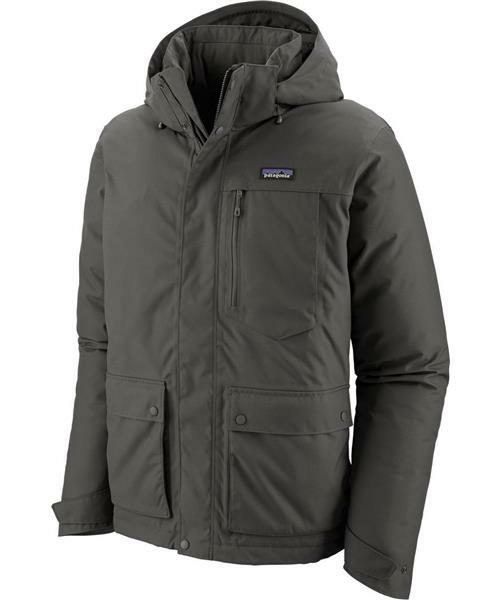 The center-front zipper features external and interior storm flaps that create a zipper garage at the chin, and the neck is lined with soft microfleece. It has handwarmer pockets lined with brushed jersey fabric, two top-entry pockets with flaps and a chest pocket with a waterproof zipper (and headphone compatibility). A dual-adjust drawcord hem seals out cold air and gloomy weather. Hip length with drop-tail hem.